Diver rescued from Underwater cave in Jackson County, TN! 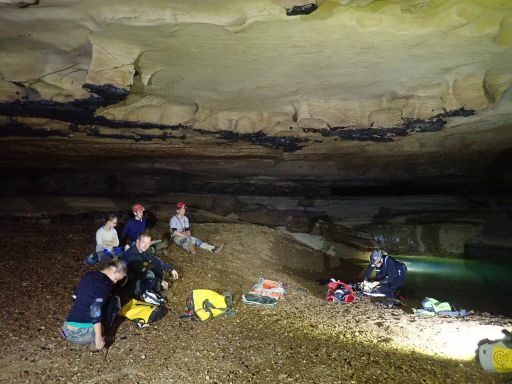 On 17 April 2019, a visiting British diver became stranded in an airbell when his guideline to the entrance of the cave became damaged. 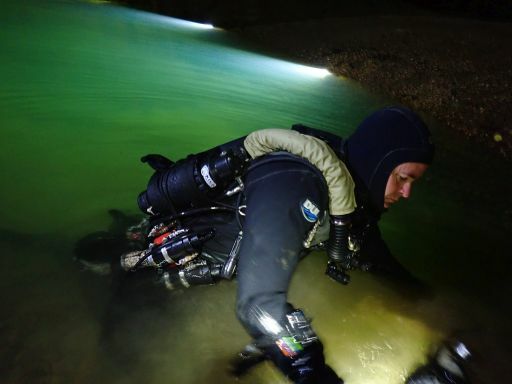 Twenty-seven hours later, Florida cave diver Edd Sorrensen, with the help of most of the cave divers in Tennessee and the Chattanooga rescue squad, made a short dive to the airbell and guided the diver to safety. Certainly movie material, but in these days of amazing cave diving rescues, the luck of the diver seems almost mundane. Regardless, this cave turned out to be one that I had dove a couple of years previous. Of course, there was survey data and a crude stick map was produced for the rescue crews. The news outlets are looking for something to display to the public. Though I have little faith that the original map will be shown on TV, perhaps they will make some flashy TV graphic out of it. Regardless, here is the completed map, for those interested. For those more detail inclined, please note the survey grade. 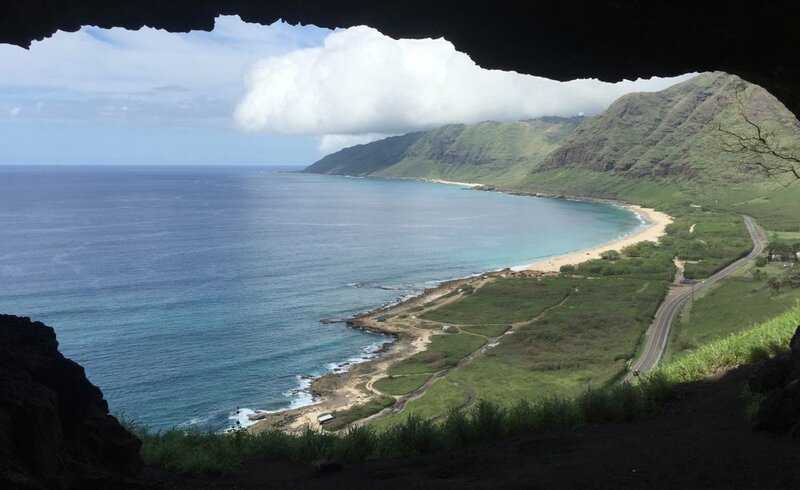 View Northward from Upper Makua Cave. Most people will tell you that there are no caves on Oahu. Caves, in the Hawai’ian sense mean something much different here than on the mainland, more of a Pacific North West interpretation, which means we are talking about Lava Tubes as well. The Hawai’ian island chain, built up from volcanic eruptions has a large number of lava tubes. The Hawaiian Speleological Society has slightly over 1000 distinct entries in their records, the vast majority of which are located on the Big Island, or Hawai’i. (How’s that for confusing?) Here on Oahu, the volcanos are much older, and the relatively fragile lava has been eroded by wind, sea and rain for more than 2 millions years. Most lava tubes have collapsed, and only the faintest remnants remain. Soon after my arrival, I was disappointed to find all this out, but conversely, intrigued by the presence of Kaneana (Makua) Cave. The entrance at Kaneana (Makua) Cave (Lava Tube). Kaneana Cave is a heavily travel worn cave on the side of the road on western Oahu. At one time the inside was covered in spray paint, which, later on, was covered again with some sort of black tar-like substance. If there were any historic markings in the cave, they are long gone now. The cave is heavily traveled by tourists, equipped as those in the picture above, and fortunately for them, the cave is not particularly extensive. Though heavily damaged, the cave was intriguing. A short wander from here, brought me to a completely different kind of cave. Properly attired tourists attempt to navigate the 8 foot stem up out of Mermaid Cave. Using the ‘ol Google Cave Search, I was directed to a place called Mermaid Cave. Immediately upon arriving, I realized these were not going to be lava tubes. This cave was located in a thin bed of limestone, or possibly carbonate eolianite, no more than 15 feet thick. As I wandered around the island, It became apparent that this limestone layer was prevalent in many places around the island, and that many divers were diving in “lava tubes” in a place called Shark’s Cove. This was the area where we would start. Armed with snorkeling gear, we began the search. Chrissy was relegated to surface pictures, with her newly broken arm. Right away, we happened across shallow caves, easily accessed from the surface, and huge numbers of tourists and local divers. We started with snorkeling gear, but quickly realized this would take more equipment. Things progressed rapidly, and every trip required more and more gear, and earlier and arrivals to avoid the hordes of tourists. Sidemount gear was the next step. Soon, the first maps were being produced. 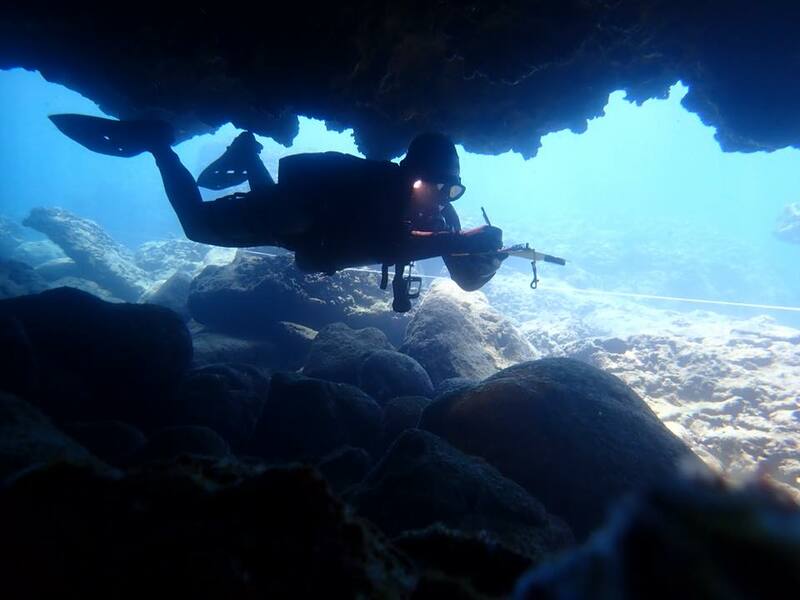 Due to the high number of open water divers in the caves, we realized that we were not going to be able to leave any lines in the caves overnight. We had to work on one part of the cave at a time, then pull all the lines. I streamlined the process by doing an initial dive to lay line, then survey it. Then we would get out of the water, with someone pulling gear guard, I ran to the car, entered all the data and created the plot, which I transferred to the diving sketch sheets. Then we got back in the water for a second dive. I would sketch the cave, then either I or my dive buddies would pull all the lines from the cave. Starting at 7 AM we had lines in the cave for less than 4 hours at most, but in some cases, this was still WAY too long. Invariably open water divers would wander into the cave and become entangled. Sketching the cave on the second dive. The survey progressed rapidly, and produced nine separate caves all in the same area. In total, the caves around Sharks Cove produced more than 2000 feet of cave passage, mostly in short stretches and mazy connections. A portion of Bristley Cave, showing a popular feature called The Elevator. Unfortunately, three divers died here in 1987 when they failed to realize just how complex this little cave actually is. Mapping continues around the island of Oahu, and there are rumors of many more caves (none of which are lava tubes, interestingly) below the water level here, and we will continue to catalog and map them as time allows! Connection! Russell Cave, AL has a new entrance, and a new length! The underwater connection between Russell Cave and nearby Montague Cave has been assumed for many years, though never actually connected. 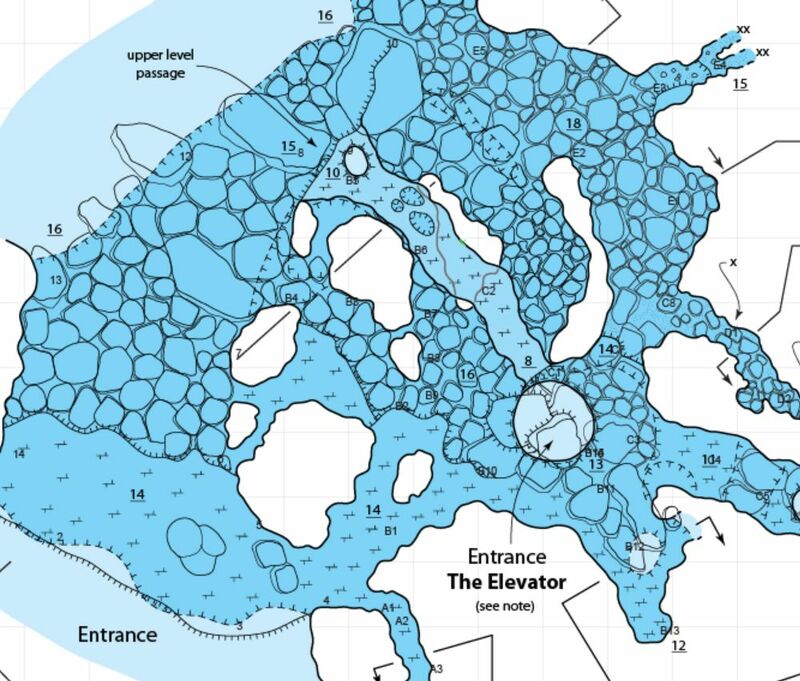 A map exists that shows the two caves separated by an approximately 1600 foot gap from the assumed sump area in Montague Cave, to an area called Methane Alley in Russell Cave. In 1991, exploratory dives were made by Jim Smith in Montague Cave, with the intent to connect Montague to Russell Cave, as well as Widows Creek Spring at the ultimate downstream end of the cave system. He explored and surveyed his way to to Widows Creek Spring, but due to equipment failures, only made a short exploratory dive into the upstream spring passage from Montague Cave. 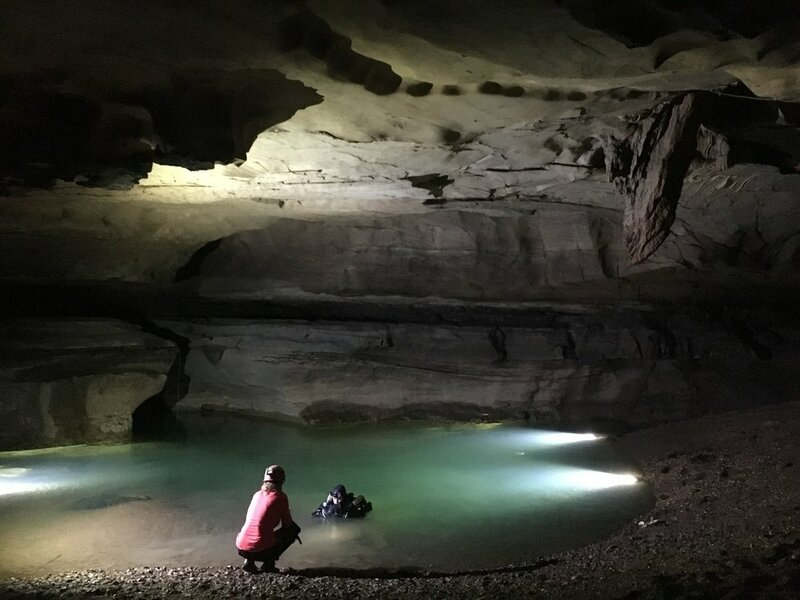 On 10 October, I made the first exploratory dive in Montague Cave in more than 25 years, with the intent of looking at the passage leading to Russell Cave. As there was no flow at the time, Surprisingly, I ended up in a downstream passage, paralleling the main trunk passage that nobody knew existed. That wouldn't be the case today. Having seen the boil from the upstream passage two weeks ago, I knew where the entrance would be located. This time, I would bring all the equipment for a 1600 foot exploration dive, as massive floods clean the cave of any lines, so each time, the line must be replaced, and the odds of making two dives between flood events would be unlikely. Knowing that the shortest possible dive would be 1600 feet, I brought three of my largest Light Monkey Reels with a total of 2700 feet of line, as well as a Light monkey heated vest for the chilly 57 degree (F) water. Tanks would be steel 50s, small enough for my part time porters to carry to the sump, but plenty of gas for me to swim 1600 feet, should the need arise. Once geared up at the sump, though the pool looked fairly good, I was disappointed to find the visibility in the passage would only be about 7 feet. This would make exploration difficult, as it would be hard to see side passages, or dead end loops. Fortunately, the periodic high flow in the passage creates a black cemented coating on the floor cobble which remains clear of silt. In most cases, I could follow the black cobble trail through the passage and be assured I was in the middle of the cave, with only the occasional 15 foot sand and debris dune to cross over where the passage turned. Places to tie the line were extremely rare, and silt stakes (1/2 inch PVC stakes commonly used to secure line in wide passage) would not penetrate into the cobble floor, forcing me to drop hundreds of feet of line without a tie off, hoping it would not work itself into a crevice that would be too small for me to negotiate on the way back. The low visibility meant I frequently could not see either wall, and in places, only a small amount of the floor below me- blindly following the black cobbles, hoping I was not working myself into some dead end side passage. With the depth staying around 15-20 feet, this meant I normally could not see the ceiling either, which meant frequent bounces to the ceiling to check for air bells, of which, ultimately, there were none. High end equipment produces results: Light Monkey 32W LED light and heated vest cannister batteries, Light monkey 800 foot reels, KISS Sidewinder rebreather and DUI CF200 Drysuit. Searching for placements and swapping out reels, after 53 minutes, I finally came to an airbell. Standing in waist deep water, I could see an orange dot of fingernail polish- a station placed by Pat Kambesis, while surveying Russell Cave's Methane Alley in 2014. The connection had been made. But the work was not complete, all of the new line had to be surveyed, and the empty reels recovered. The exit dive, while surveying, actually went faster than the exploration- 47 minutes to capture all the data. Ultimately, the dive survey of the connection between Montague Cave and Russell Cave would be 2006 feet long. Three reels proved prudent, as only half of one reel remained once I reached Russell Cave. The biggest surprise of the day appeared only after the data had been input into the cave survey: The end of the dive line was only 25 feet away from the location it was supposed to be- meaning a 25 foot total error across more than 5900 feet of passage! This is truly a testament to the improvements in survey techniques and equipment, as all of the known passage was surveyed using digital instruments. Yellow: Pat Kambesis survey of Russell Cave, Red: Connection sump survey (Jason Richards), Dark Blue: Downstream Sump (Jason Richards), Pale Blue: Montague Dry Survey (Jason Richards, Christina Richards, Andy Zellner) Dashed Line: Surface connection survey. The total length of Russell Cave, including the new Montague Entrance and associated new dive lines is 61,385 feet or 11.625 miles. Thanks to all the porters and friends who have provided their backs to carry gear to the water, the landowner of the Montague entrance, who has graciously allowed us to work from his property, and most of all, my wife and dive buddy Christina Richards, who has sat at the beach for these dives, both excited and terrified when I invariably over run my expected return time. As a closing note, please do not inquire about diving or caving at Russell Cave National Monument. For the time being, the park is prevented from allowing recreational caving due to the presence of significant archaeological artifacts. Survey and exploration currently being conducted is under permit with the National Park Service, as inventory of cave assets.